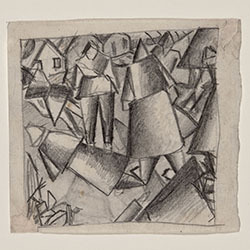 Bloomington’s (temporary) loss will be Louisville’s gain as close to 100 paintings, sculptures, and works on paper make their way from the Sidney and Lois Eskenazi Museum of Art at Indiana University to Kentucky’s Speed Art Museum. Closed for renovations, the Eskenazi Museum (formerly IU Art Museum) has kept its collection out of sight since May of 2017. It isn’t scheduled to reopen until the fall of 2019. The loan is part of a five-year partnership between the two organizations, led by Jenny McComas, the Eskenazi Museum’s Curator of European and American Art, and Erika Holmquist-Wall, the Speed’s senior curator of European and American paintings and sculpture. Once Eskenazi reopens, works from the Speed will be seen there. The first exhibition, “Picasso to Pollock: Modern Masterworks from the Eskenazi Museum of Art, Indiana University,” opens June 16 and will remain on view through January 2019. 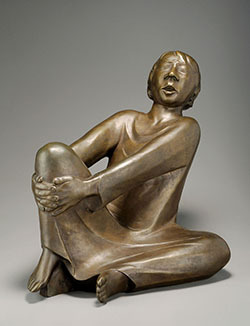 In addition to those artists in the title, it will include work by Henry Moore and Diego Rivera. Key works from the Eskenazi collection will also be included in a second exhibition highlighting 19th century landscape painter Thomas Chambers. It opens in July. Additional works will be including in other Speed galleries later in 2018. “We hope it helps get our museum’s collection better known in the region,” said McComas. Once people see it, they might be willing to travel up here.” She also sees benefit in giving greater access to the collection to those at the IU Southeast campus. Free admission to the Speed is being offered to IU students, faculty and staff during the loan period. As is traditional, the receiving institution will take on most of the cost of the transfer of the artwork. As part of the partnership, neither institution will be charging the usual administration fees for processing of loans. And each museum can hold events with facility rental fees waived. Kentucky’s largest art museum, the Speed is housed on the University of Louisville campus. It marked its 90th anniversary in 2017. It reopened in 2016 after a $60 million renovation and expansion. 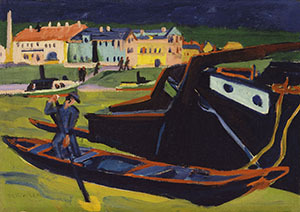 The Eskenazi Museum of Art, founded as a small teaching collection in 1941, now includes more than 45,000 objects. The renovation of the I.M. Pei-designed building will include expanded gallery space and new teaching facilities. It’s funded in large part by a $15 million gift from Sidney and Lois Eskenazi as well as matching funds from For All: The Indiana University Bicentennial Campaign.